Life is full of challenges and struggles, which keeps on testing person’s stamina, knowledge, patience, courage and faith from time to time. In order to stand out of the crowd, a person has to go through a lot in order to become what he has never thought of. However, having God holding your hands in all the circumstances is what everyone prays for. This is very much possible through the only Brahm tool- Divine Knowledge. In order to be steadfast on the path of Divine knowledge, Divya Jyoti Jagrati Sansthan (DJJS) – a non-government, non-profit and a leading spiritual organization, head and founded by His Holiness Ashutosh Maharaj Ji, organized an event of Monthly Spiritual Congregation on 2nd October 2017 at Divya Dham Ashram, New Delhi. Many preachers enlightened the audience with their blissful words and experience of Divine-Knowledge. When a perfect spiritual master comes in life and bestows you the Divine eye, it takes you through the gateway of God’s kingdom. It empowers disciple with unshakable faith, complete knowledge, practical experience, channelize the inner-potential and energy in the direction of ultimate goal of life. The event commenced with holy chanting and sincere prayer at the lotus feet of Lord. 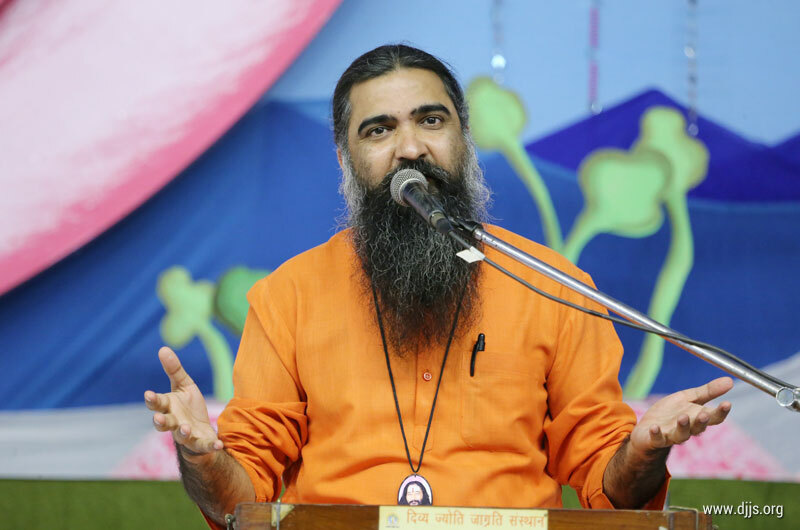 Thousands of disciples marked their valuable presence under the divine shade of Shri Maharaj Ji on the pious land of Divya Dham Ashram. Many preachers shared their invaluable experience which they have gained over a period of time in this spiritual journey having surmounted a lot of challenges, which actually grew them, made them strong, bold, brave and what they are today. The words of wisdom coming out of their experience enlightened the audience and opened their minds which made them to see the bigger picture of spirituality and to realize the sole purpose of life. The event of Spiritual congregation served its supreme purpose when disciples felt sense of fulfillment, and ray of hope through spirituality in their life. Many disciples pledged to continue their journey with utmost zeal and unshakable faith while praying and showing gratitude towards the Lord.